Abducted. The term sounded strange, but it was the only explanation. Expert canyon tracker, Jason Cloud, discovers the hard way that accepting a stranger’s help carries a high price. Suddenly he’s the newest member of a whole tribe of people who remind him of his deceased native grandfather. Not only can he not go home, Jason is supposed to repay his karmic debt by becoming their holy woman’s mate. The honorable and beautiful Shaman Aiyana admits she’s been waiting years for him to come to her. His head has yet to stop spinning over what he sees. Can life among the Chileaans really be his destiny? Want To Read A Multi-Chapter Excerpt? 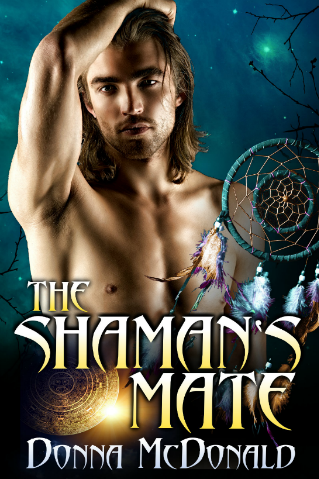 The Shaman’s Mate is a beautiful story of love, patience, forgiveness, passion and compassion. Although it is a fast paced story, the roast may burn because all of your senses will be saturated and you are preoccupied, therefore, you will not detect the mess you are making since you too, are in another realm. Wow, I loved this book. ~ Black Raven Reviews, Rated 5 Ravens and a Recommended Read by Naunet!